On Tuesday, November 6, the feast of the Icon of the Mother of God "Joy of All Who Sorrow," Bishop Nicholas of Manhattan paid an archpastoral visit to Joy of All Who Sorrow Church in Philadelphia, PA, where he led its patronal feast day. At Divine Liturgy, concelebrating with His Grace were Archpriests Mark Shinn (rector of St. Andrew Naval Cathedral in Philadelphia), Serge Lukianov (dean of New Jersey), Liubo Milosevich (rector of Holy Trinity Church in Vineland, NJ), Boris Slootsky & Seraphim Chemodakov (clerics of St. Alexander Nevsky Diocesan Cathedral in Howell, NJ), parish rector Priest Valery Sukholobov, Priest George Kaplanov & Protodeacon Leonid Roschko (clerics of St. Alexander Nevsky Cathedral), and Deacon Pavel Roudenko (cleric of the Synodal Cathedral of the Sign in New York City). The parish choir sang prayerfully at the service under the direction of conductor Elena Shibaeva. "Today we honor the memory of the Icon of the Mother of God ‘Joy of All Who Sorrow.’ Today specifically, we commemorate a miracle that transpired in Moscow in 1688. 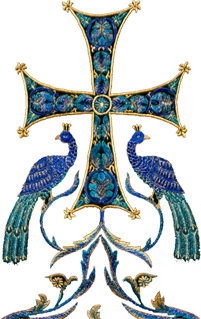 "This miracle from this holy icon took place in St. Petersburg in 1888. Lightning struck a chapel where the icon was being held, and the chapel burned down. After the fire, the icon was found unharmed, and the face of the Theotokos shone with divine light. Next to the icon had been kept a cup for donations; during the fire, the cup had popped, and the coins had been thrown about the whole church, with some of them stuck to the icon. 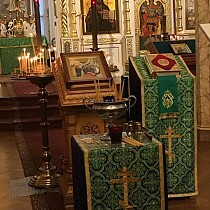 Later, in memory of this event, a church was erected in the city, wherein the icon was kept. During the years of godless rule, the church was destroyed, but, by God’s grace, in our days it is being restored. This past summer I was there, and it is so good to pray today before this icon, glorifying the Mother of God and remembering these holy places of Holy Rus’. "Once more I thank all those who came to church today to glorify our wondrous Lady. If we will not abandon the Mother of God in our prayers, so too will she not abandon us. Before her dormition, she prayer to her Son, the Lord Jesus Christ: ‘And Thou, my Son and my God, receive my spirit.’ Only she, the wondrous Lady, could say these marvelous words. And today we believe that the Mother of God hears our shared prayer, and brings our humble petitions before her Son and our Lord. Let us remember this and rejoice that we are not alone, that we have a loving Mother; let us always make haste to our church, in order to ask her blessing in the work of our salvation." Upon completion of the service, a short moleben was served before the Icon of the Mother of God "Joy of All Who Sorrow." The deacons then intoned the Polychronion for the hierarchs, clergy, sisterhood, choir, and the entire parish. On behalf of Metropolitan Hilarion, Bishop Nicholas congratulated Fr. Valery and all of the parishioners on the occasion of their patronal feast, wishing them all prayerful continuance of their faithful service to Christ’s Holy Church. In turn, the rector thanked His Grace and all of the guests and those who labored to make the feast a successful one.